Chris is a quiet and private man. His spiritual life is integrated into everything he does. Until recently, he has been away working on his book and DVD's. Check out the recent DVD which can be purchased from ChrisRowen.com! 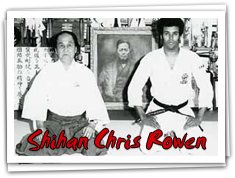 Shihan Chris Rowen is available for Seminars and courses, for more information contact Chris personally by email. Bunbukan institute is currently running a series of workshops to cater for individual Dojo needs, contact Shihan for further details.